An Edwardian design classic, this is one of our most popular made to measure oak doors. Two rectangular glazed panes over single or double lower panels. This subtle design can be as simple or extravagant as you like depending on which options, glass and door furniture you choose. Choose our standard glazing design or design your own door and send it over to us and we will quote it for you. Other glazing options are clear, sandblasted or pattern etched, the doors can accept double glazed units up to 20mm thickness. Shown here with a Dentil Frieze, Double Cricket Bat Panel and Standard Single Leaded Glass. Other options are configurable at time of order. Available in softwood, hardwood and oak, prices start from £720.00 (unglazed) or £ 1132.00 for the door as pictured. If you need a little bit of inspiration, visit our Bespoke External Doors Gallery for some ideas on your perfect External Door. Hardwood & Softwood external doors are supplied in Primer as standard, Oak external doors are supplied unfinished. Our standard doors are handmade from excellent quality joinery grade softwood, either straight-grained Douglas fir or Hemlock with exterior grade MDF panels. Alternatively we can make this door in reclaimed pine, Sapele or Meranti red hardwood or oak. Our standard leaded stained glass designs can be made in your choice of colours and can be adapted to fit almost any door, sidelight or fanlight. Other options available in single glazed or double glazed safety/thoughened glass are: clear; plain or bespoke frosted or acid etched; bevelled; etched pattern glass and textured glass. All our external doors are made-to-measure to exact customer sizes and specifications. 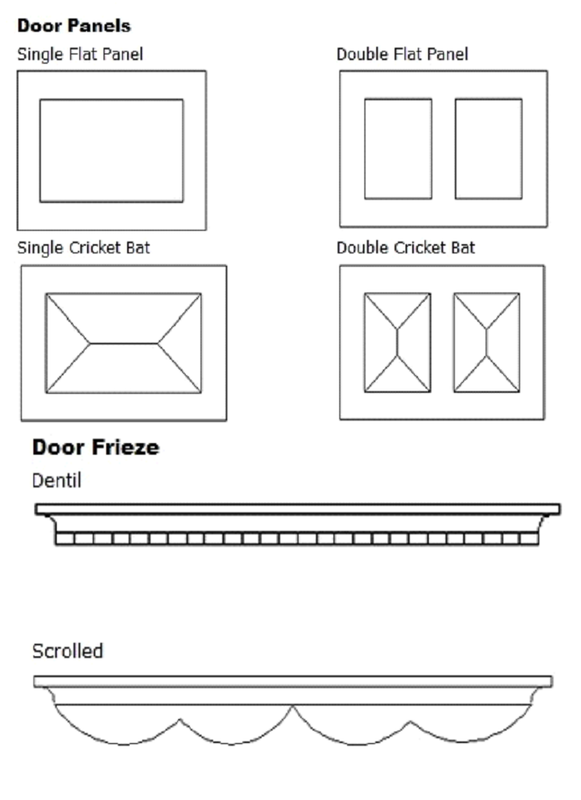 Please see below various door design options.